Sometimes things happen that distract you, you don't see that yet another year is slipping away, nor the 78 blog-free days that are going with it. But sometimes other things happen that put you back on track. Like an apple cake, the Christmas tree, Lucio Battisti, or some birthday wishes. It was my first cake ever, we were 9 or 10 year old, messing around in the kitchen during summer afternoons, we had the same dreams about our future, but different ideas on boiled rice. It's one of those memories we must go back to, the kind that makes you feel good right away, a long hug, welcoming and delicious. And in the end it doesn't matter whether or not it's been the first that ever came out of your oven: apples, cinnamon and sugar, and eternal gratitude to the apple cake. Beat butter until creamy and gradually add sugar, vanilla, eggs, grated rind and juice of one lemon, and salt. Sift together flour, baking powder and corn starch, then gradually add them to the butter mixture. Add a little bit of milk (buttermilk for me... sorry but my foodblogger soul and the need for tenderness forced me to make a change on the original), until the batter is soft enough (about half a glass). Peel the apples and cut them into wedges. Line them with a fork, and mix them with sugar, cinnamon and lemon juice. Pour the batter into the baking pan, previously greased and floured, and arrange the apple slices on top. Bake at 360 for about 45 minutes until a toothpick inserted in the middle comes out clean. Let the cake cool off on a wire rack and serve dusting it with powdered sugar. 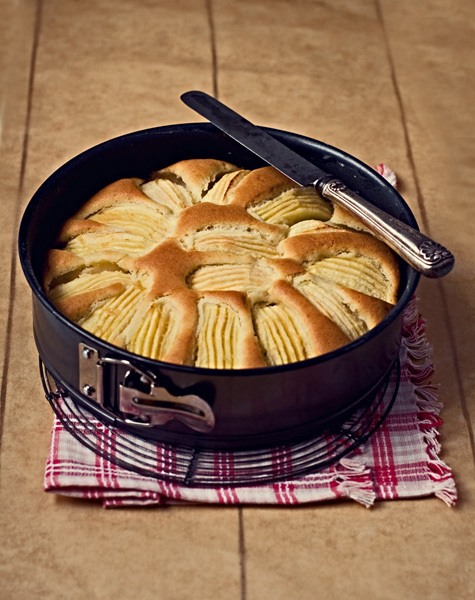 It's a long time ago since I've seen this cake, back home in Holland we used to make it all the time (especially in autumn and winter with apples from our orchard). Perhaps a tip you could try: mix cinnamon powder and fine table sugar about 1:10 and sprinkle it over the cake at the very moment it leaves the oven. The sugar will melt a bit and makes a crunchy top on the cake. (my favorite part). Oh and by the way, pears will do just as fine as apples, use the ones which are almost ripe (otherwise too much liquid).